At the time of writing, Jamie Carragher has played 724 games for the Anfield Giants, and if you were to ask most fans of Liverpool who they'd have rather had in their team out of him, Ferdinand, and Terry they'd say Carragher, and most wouldn't even give it a second's thought. Certainly the Liverpool fans I know at least. So statistically, how did he compare? When looking at the Ferdinand vs Terry defensive stats, there wasn't much in it - Terry was more likely to keep a clean sheet, but Ferdinand was more likely to do it against better opposition. Comparing Carragher to the two multiple title winning defenders isn't going to be completely fair given the quality of the teams the other two have played with - certainly the final league positions, but I thought it might be interesting nonetheless. This will be a shorter one that usual as most two thirds have been covered here. First up is the simple clean sheets against appearances. Terry leads the way in both the number of clean sheets (159) and the rate of clean sheets with one every 1.96. Unsurprisingly Ferdinand has the next best rate as you'd expect from five title winning seasons. However, when looking at Carragher, he actually kept more clean sheets than Ferdinand with 144, and like John Terry, has managed to keep over twenty clean sheets on more than three seasons - a phenomenal achievement. 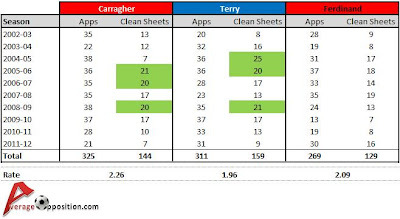 And like Terry, Carragher kept at least ten clean sheets eight of the last ten seasons, compared to Ferdinands. Take into account Liverpool's average league ranking was 4.7 in that time - with a low of 8th last season. Ferdinand's Man Utd have an average ranking of 1.6 in the same ten year period, and Terry's Chelsea is 2.4. Ferdinand leads the way with the rate of clean sheets against the Top 6 teams in the Premier League with one every 2.44 games, compared to Terry's 2.61 and Carragher's 3.13, though the Liverpool man has achieved two more clean sheets against the Top 6 teams than his Chelsea conterpart. So whilst Carragher is behind his peers in the games per clean sheet rate, his 2.26 is certainly impressive, although the rate against the Top 6 isn't quite on the same level as the other two - reflected in Liverpool's league positions in the ten years. All three have conceded less than a goal a game over the ten years, though the rate drops when taking into account the Top 6 opponents for all three players. For new readers, the main aim of this site is to identify the Big Game players, and keeping with that theme, the biggest games in club football are in the European Champions League. Carragher has played in 10 qualifying games - keeping 6 clean sheets, and conceding just 4 goals as Liverpool safely made it through in the five seasons needed. Moving onto the group stage, where the games are lower pressure and the opponents are in general weaker, Carragher has a decent 16 clean sheets in 36 games - a lower rate than Ferdinand and Carragher, but still a decent return. The big games however can be measured in the knock out games. Whilst Ferdinand is the clear winner with a clean sheet every two games in the knock out stages of the Champions League, Carragher actually has a much better record than his Chelsea rival - keeping a very decent clean sheet for every 2.77 games, compared to Terry's 3.4 games. In terms of goals conceded, once again it's Ferdinand that has the lowest number per game, whilst Carragher's is just worse than Terry's with 1.1 each (1.07 to 1.12). 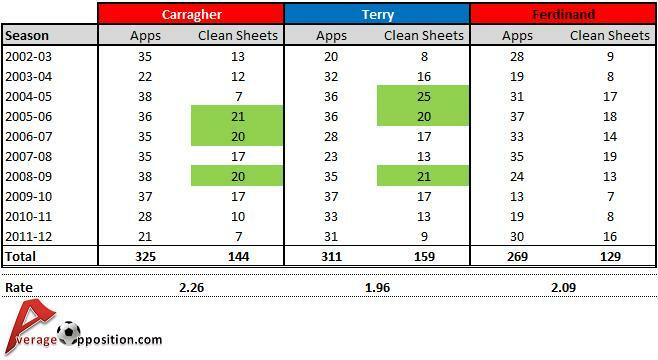 So on the big European Stage, Ferdinand is king, but Carragher out performs Terry in terms of clean sheets. On the Ferdinand vs Terry piece, I looked at Goals scored as a measure. I think it's fair to say that's probably not necessary for Carragher! However, another measure was the defensive stats in domestic cup finals - another measure of big game players. Whilst Ferdinand has three clean sheets for five domestic cup finals to Terry's two in seven, Carragher's appearances have seen one clean sheet (against Man United) in the League Cup and the 2006 FA Cup Final saw im concede three goals against West Ham (one of which he scored). He does of course have winners medals for the 2001 FA Cup and League Cups as part of their Cup treble - none of which contained clean sheets. I'll leave this one up to the reader. The stats of course only tell half the story but they're interesting nonetheless. Many would argue that Carragher's best game for the club was in the 2005 Champions League Final - but statistically, they let in three goals. All three have been outstanding for their clubs in the 10 year period from 2002-03 to 2011-12, and it's unlikely the fans of each club would swap for another.